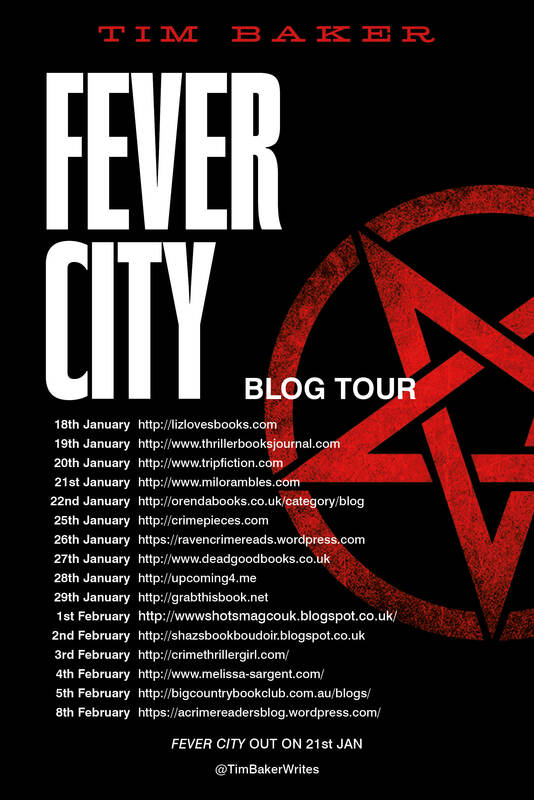 It’s the next stop on the blog tour to mark the release of Fever City from debut crime novelist Tim Baker. I will be brutally honest and say that I did embark on the book with a certain amount of suspicion, as having read widely on everything JFK conspiracy related, I did wonder if anything new could be brought to the wealth of theories that Kennedy’s assassination spawned, and the bravery of an author who would tread this well-worn path. I am incredibly pleased to report that Baker has achieved something quite special with this one, firmly dispelling any pre-conceptions that I held about the book. You’re intrigued now aren’t you? Apart from inserting a breath of fresh air into the whole mythology surrounding not only JFK’s demise and the agencies behind it, Baker brings into sharp focus a fine array of cultural references from the 60’s period, and the personalities that shone so bright in this golden age of American popular history. I liked the way that Baker explored the power hungry Joe Kennedy, the fragility of Monroe, the poignancy of Sal Mineo’s secret life, and the clear sighted and cold hearted scheming of Mafia figure Sam Giancana with his connections to the Rat Pack and JFK. I particularly enjoyed the way that Baker perfectly controlled the inclusion of these figures in the plot too, heightening the realism and feel of the plot, with some interesting revelations along the way that did not feel contrived nor far fetched. With three narratives, four time-lines, and a mixture of first and third person narration to juggle, it’s hard to believe that this is a debut, such was the control of all these elements within the book. As a book of significant length (in relation to most crime novels) I was also delighted by how long Baker managed to hold off the unfurling of revelations between the 60’s, and the contemporary storyline, in terms of the implications of Alston’s and Hastings’ personal involvement in the investigation of the kidnapping and the JFK assassination and its ramifications. I found my reading sped up considerably as I devoured the last few chapters at a pace, with a nice sense of ‘well, I wasn’t expecting that’ included. I thought this was a genuinely terrific thriller; clever, well-researched and beautifully executed, as the action ebbed and flowed, keeping me on tenterhooks throught. There’s scheming, corruption, violence, and a strong sense of the personal cost that power, political envy and money can bring in its wake. The writing is sharp, dispassionate but endlessly engaging, and equally unsettling. In fact, the greatest compliment I can pay to this book is that I did feel an echo of James Ellroy along the way, not only with the assured inclusion of instantly recognisable figures, but also in some passages a slight mirroring of Ellroy’s punctilious and spare style, when the main protagonists slipped into stream of consciousness, or when a relevant social/cultural observation was needed to be made. A kind of revisiting of LA Confidential with a Texan twist…. Highly recommended. Four friends, caught in a terrible job market, joke about turning to kidnapping to survive. And then, suddenly, it’s no joke. For two years, the strategy they devise works like a charm – until they kidnap the wrong man. Now two groups are after them – the law, in the form of veteran state investigator Kirk Stevens and hotshot young FBI agent Carla Windermere, and an organized crime outfit looking for payback. As they crisscross the country in a series of increasingly explosive confrontations, each of them is ultimately forced to recognize the truth: the real professionals, cop or criminal, are those who are willing to sacrifice everything. Owen Laukkanen’s The Professionals accompanied me to work everyday last week, the importance of that being, that when you settle down on your lunchbreak away from the trials and tribulations of the workplace and you just need to escape for a while, you need a book like this. Fast moving, plenty of twists and turns and a genuine lack of clues as to how the story will resolve itself. Should also say that thanks to Laukkanen, there were a couple of late returns back to work whilst reading this one! The absolute stand out feature of this book for me, was the incredibly control of pace and plot that Laukkanen produces. I loved the initial premise of the story, that one career choice when you leave college with no hope of full time employment is to band together with a group of mates and just kidnap people. Don’t ask for huge ransoms. Don’t hurt them. Everyone’s a winner. But the best laid plans can always go awry and after kidnapping the wrong man our four amigos embark on a flight from justice after a particularly foolhardy act. Pursued by a dogged law enforcement officer working out of Minnesota, Kirk Stevens, and a ballsy FBI agent, Carla Windermere, the foolish foursome encounter numerous scrapes, violence and separation along the way, as well as picking up another stray soul to add to their number, and causing the dissolution of a relationship whose ferocity of passion would put Romeo and Juliet to shame. As the fugitives flee, drawing on their reserve of false identities, but troubled by their depleting funds, they are forced into another kidnap, and a bid to release one of their number from custody resulting in a tense, violent, and almost poignant conclusion. The plotting is almost seamless throughout, transporting the reader effortlessly from state to state, in a real game of cat and mouse, as the net closes on the kidnappers. Balanced perfectly between the increasing desperate measures adopted by the fugitives, and the mostly calm and controlled investigation by the law enforcement agencies, evinced by Laukkanen’s inclusions of FBI investigative procedures and practices, the book races to its conclusion at a breakneck speed, which does make it incredibly difficult to put down. I thoroughly enjoyed the characterisation of the kidnappers, Arthur, Marie, Mouse and Sawyer, and the pivoting relationships between them, as the peril increased and the pressure really starts to rain down on them. I found the relationship between Arthur and Marie particularly touching and a wee bit heartbreaking (even for an old cynic like me) as you will discover for yourselves when you read it. I also enjoyed the banter and good natured joshing that existed between them, and the appearance of an almost sibling- like relationship particularly between Mouse and Sawyer. However, I was altogether less convinced about the police protagonists, and the hackneyed attempt at producing some kind of sexual tension between them, that felt altogether a bit forced. Also the sporadic interactions between Stevens and his wife, were all a bit chocolate box sweet and slightly nauseating. Really, in the light of how long he was actually away from home, this proved a bit of an unnecessary diversion to the intensity of pace that Laukkanen was building overall in the increasing pace and excitement of the investigation. All in all though, a pretty satisfying thriller that kept me on the edge of my seat, if not entirely perfect in the balance of the realisation of the characters.